With any kind of bathroom renovation, the key is to remove all the potential problem spots and bumps in the road in advance. Careful planning is nowhere as important as it is in incorporating eco-friendly and energy-efficient bathroom elements in your remodelling project. A detailed strategy will help you stay in focus and complete a green bathroom that will save your and the planet’s resources, while ensuring that you finish the remodel on the schedule. The more ideas and design concepts you accumulate beforehand, the more quickly and cost-effectively you can execute and implement them. Nothing is more frustrating than seeing an item you want and not being able to order it from supplier who is out of stock. So, make sure you move fast and purchase the materials and fixtures on time. Even if it’s just a picture of a colour scheme, the shape of a tub or shower, or even an overall feel of the bathroom, save it so you can show it to your designer, North Vancouver Bathroom Contractor, sales person, etc. You need to ensure you have a realistic budget for the project. Professional remodels will start at $20,000 and if you do it yourself, the top cost shouldn’t be above $10,000. Bear in mind that the majority of the budget accounts for labour costs, but even if you decide to DIY, you need to calculate the time you need to spend off your profession. Another big chunk of the budget goes to the actual materials used. Today’s market is brimming with green innovations; however, for you to tell the gimmicks from truly energy- and water-efficient products, best stick to proven designs which are constantly improving. Inexpensive and easy to mount, low-flow shower heads can restrict water flow to 5-7 litres per minute, cutting water consumption by 50-70%. Definitely the most cost-effective option long term, a modern hot water system produces fewer greenhouse gas emissions than electric hot water systems, and often has lower usage rates than electric boilers. Although they will compensate their cost through the savings they provide, keep in mind that many green materials are more expensive at the front end than regular ones, and some of them need to be ordered specially. On the other hand, virtually every bathroom item nowadays is available in an eco-friendly, more sustainable version. A champion of green choices, bamboo is noteworthy for its fast growth and renewable properties, as well as for its number of uses. It can be used for stunning bathroom-friendly wood flooring which won’t mind an occasional splash, as well as area rugs and bath mats made out of woven bamboo fibres. The versatility of bamboo doesn’t end here, as it’s equally popular for window treatments, blinds and shades, as it is for treated countertops and vessel sinks. While you’re shopping for items and ideas, look into the calendar and estimate the best time to complete the renovation. Depending on the scope of remodelling, whether you have all the materials or not, a bathroom remodel can take from a long weekend, to a couple of weeks for complete overhauls with several teams of contractors working at the same time. Whichever category you fall into, it’s important to plan the renovation during a time you’ll be at home and able to oversee the project from beginning to end. 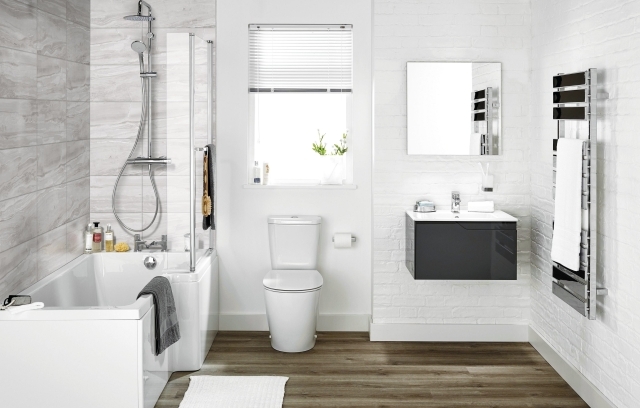 An eco-friendly bathroom is one that reduces emissions, conserves water and energy and incorporates sustainable and recyclable materials for its fixtures and furnishing. However, it is also the place where the idea of living green is alive, so don’t forget to add actual greenery to your new space.